The sun beats down hard on the town of Chili Verde, New Mexico – where temperatures flare and passions reach boiling in the midday heat. The locals spend their days downing Tequila and breaking bottles over heads… and that’s just the womenfolk! When Abel Wood, an enigmatic lone cowboy type, comes riding into town, the locals immediately suspect that he has come in search of the legendary buried gold. Quick on the draw and tall in the saddle he may be, but Abel faces stiff competition if he’s to get his hands on the prized booty. 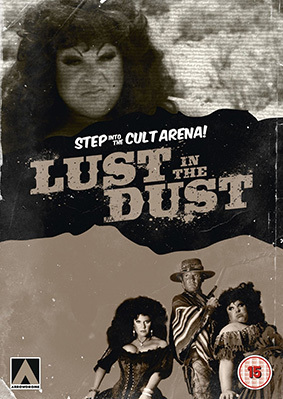 From legendary maverick Paul Bartel (Death Race 2000, Eating Raoul), the 1985 Lust in the Dust is a treat for both fans of Westerns and lovers of John Waters-type subversive humour. The film features the inimitable Divine (Hairspray, Pink Flamingos) in a typically larger-than-life performance, whilst Tab Hunter as Abel (he was also one of the producers) delivers a sharp-shooting, gun-toting turn worthy of Clint himself. It also boasts a hell of a supporting cast that includes Geoffrey Lewis, Henry Silva, Cesar Romero, Courtney Gains and Woody Strode. Lust in the Dust wilkl be released on UK DVD on 16th December 2013 by Arrow Films at the RRP of £12.99. A little tragically, there don't appear to be any extra features. Lucky we have a trailer, then.